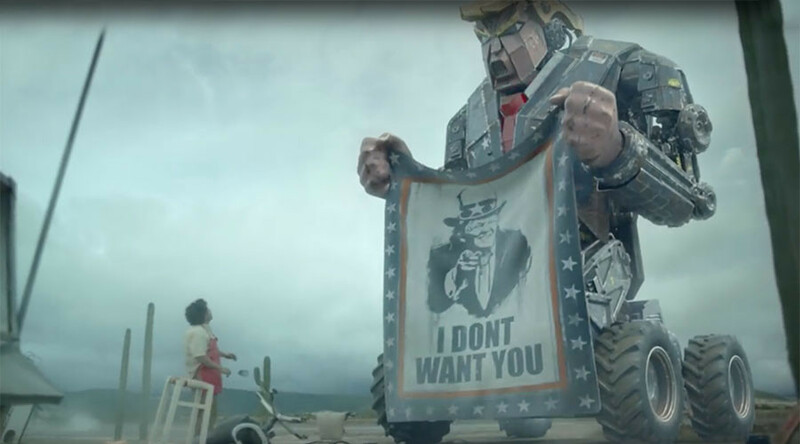 Mexicans are flung across the border wall and a giant robotic Donald Trump shoots from his crotch in a short film satirizing the president-elect’s views on immigration. Titled ‘M.A.M.O.N. (Monitor Against Mexicans Over Nationwide’) the dark comedy Sci-Fi short depicts a fantasized version of Mexican immigrants being thrown out of the US, for which they also receive an invoice. When the newly deported refuse to pay for the wall a giant robotic Trump powered by the man himself crosses over the border and with the help of some imaginative CGI starts a one-man war, using an arsenal of weapons shot from his crotch and head. Mexicans throw everything they have at Trump including a mariachi band member, a cowardly diplomat and even a fighting rooster, in an attempt to save their culture from the warpath their opponent is on.